Minister and Chairman of the Office of the Government Mai Tien Dung insists inspections are part of the normal activities of relevant agencies. No special interests will be catered to during the upcoming inspections of MobiFone’s purchase of AVG shares and the Nui Phao mining project in northern Thai Nguyen province, the government insisted on August 2. The government has directed the Government Inspectorate to investigate the purchase by MobiFone of 95 per cent of shares in the Audio Visual Global JSC (AVG). The deal was completed in January but the value is yet to be disclosed. 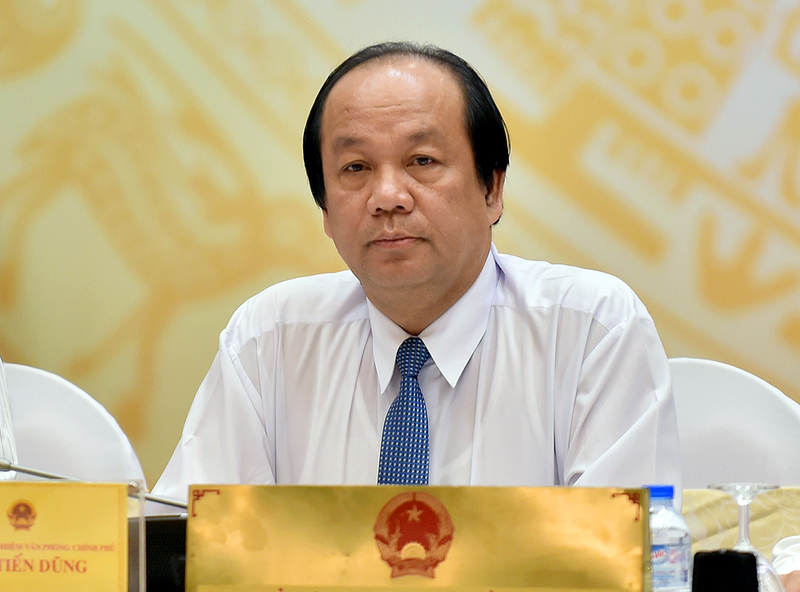 Mr. Dung added that “the government has acted after the Party Secretariat ordered an inspection into the deal.” On August 1 Deputy Prime Minister Truong Hoa Binh directed the Government Inspectorate and relevant agencies to launch an investigation into the acquisition, saying any signs of legal violations would be subject to further criminal probes. “The acquisition is a major investment by the company [MobiFone], so it should be considered carefully,” Mr. Dung told the government’s monthly press conference on August 2, without providing any further rationale for the inspection. Any organization or individual, he added, who unlawfully takes advantage of their position and authority while on duty for personal gain will be strictly punished according to the law. MobiFone announced on its website on August 1 that “the company will comply with the government inspection” but refused to provide any additional details on the deal, especially its value. After severing ties with the State-run VNPT in 2014 and now operating under the Ministry of Information and Communications, it posted revenue of VND36.9 trillion ($1.62 billion) in 2015, up 8.29 per cent year-on-year. In September last year MobiFone, which has been undergoing equitization, announced it had signed an IPO advisory contract with VietCapital Securities, owned by Ms. Nguyen Thanh Phuong, daughter of former Prime Minister Nguyen Tan Dung. VietCapital Securities secured the deal after the higher price sought by Switzerland’s Credit Suisse was rejected by MobiFone. “We met with Credit Suisse but their price was too high, so we decided to select VietCapital Securities,” Mr. Le Nam Tra, MobiFone’s Chairman, was quoted by ITC News as saying at the time. AVG, which entered the Pay TV market at the end of 2011, expects the share sale to help it resolve its financial difficulties. At the end of 2014 it held a 6.4 per cent Pay TV market share. Subscriber numbers in 2014 totaled 450,000, accounting for some 4.5 per cent of Vietnam’s 9.9 million subscribers at that time. It was founded by Mr. Pham Nhat Vu, the younger brother of Vietnam’s first billionaire, Mr. Pham Nhat Vuong, who founded Vingroup. With the Nui Phao mining project, Mr. Dung said the inspection led by the Ministry of Natural Resources and Environment (MoNRE) was approved by the government and is a perfectly normal activity. MoNRE will inspect a number of projects to determine any environmental issues and the Nui Phao mining project “is part of the scope of those inspections,” Mr. Dung said. In late July MoNRE said that it will conduct the inspection at Nui Phao after claims of environmental pollution were made. The ministry also asked the Nui Phao Mining Company, the project owner, to evaluate the impact of the project on the environment and the lives of local people. Based on the company’s report, the ministry and local authorities will decide whether it is necessary to relocate nearby villages. The project was licensed in 2005 and has significant deposits of tungsten, fluorspar, bismuth and copper, and is the world’s largest tungsten mine outside of China. It covers an area of 9.21 sq km in Dai Tu district, Thai Nguyen province. In 2010 Masan Resources acquired the project from Dragon Capital, a Vietnam-focused financial institution, and other stakeholders. The mine began commercial operations in the first quarter of 2014. Prior to Dragon Capital, the project was owned by Canada’s Tiberon Minerals Ltd, with a 70 per cent holding. Due to the economic crisis at the time, Tiberon sold the project to Dragon Capital in 2007. Dragon also lacked the capital for the project and was forced to suspend it in 2008. In July last year Masan stepped in and invested $550 million in the project. The company has targeted revenue of $288 million this year, rising to $320 million next year. Masan Resources currently holds 63.4 per cent of the project’s charter capital. In the first quarter of this year it reported revenue of VND806 billion ($36.2 million) and a pre-tax loss of more than VND400 million ($18 million). Tungsten accounts for the highest proportion of Masan Resources’ revenue, reaching VND450 billion ($20.2 million).